A modern, conservatory-style tea and coffee shop on Dixon Street. I'm obsessed with this new tea house. 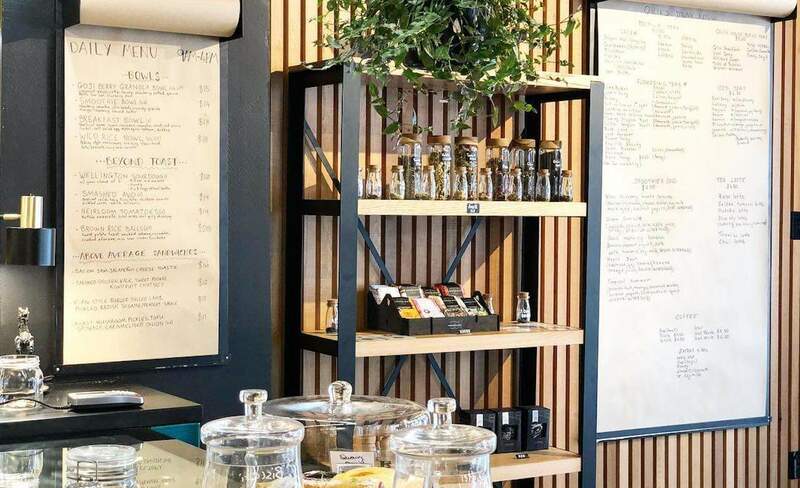 A modern, conservatory-style tea and coffee shop, set to compete with popular coffee houses Memphis Belle and Flight Coffee Hangar — also on Dixon. This will no doubt be the summer hotspot for people-watching with iced tea in hand. While there are no signs of any actual alcohol yet, taps are in place atop the teal countertop. Sitting on a leaner next to the large open street front window, I watch the array of people cross Cuba atop the Dixon Street rainbow. Passersby peer in through the storefront to get a glimpse of the menu on the wall. Patrons float in and gather around the bright, modern booths. The industrial ceiling and concrete floor set the cool, urban vibe, backed up by Amy Winehouse coming from what is no doubt an uber modern sound system. Hanging from above, on the tables and tucked away on shelves a range of green pot plants and succulents. So Melbourne-esque. The mezzanine shelving above the dark aqua tiled bar houses samples of homemade pickles and I eye up the lime marmalade. For sale are t-shirts, keep cups and glass/ wood teapots as minimal as the shelves holding them. Upon arrival I couldn't resist ordering my standard mocha, but by the time I'd finished reading the large drinks selection it became obvious that I would have to try something new too. At $5 for a Flight Coffee mocha, Qilin seems to be priced in line with the rest of Wellingtons inflated coffee prices. The latte art was impressive enough that I wasn't bothered. Their large range of tea including house blends, iced teas and tea lattes range from $4.50-6.70. A good range of both hot and cold non-alcoholics. While there were several drinks on the list that I'd never heard of or tried before, I'm a sucker for dessert and so a tiramisu latte was ordered and downed. A selection of smoothie bowls and sandwiches packed with flavour are the main food options. Bacon and jalapenos and cheese is a hard combo to beat. I munched down that toastie like there was no tomorrow. There could have been more bacon or more jam to the bacon jam but that could just be me being gluttonous. It was about what you'd expect for $10 in Wellington. Some of the more expensive toasts and bowls reached a price range of $19 — it must be the avocado of it all. That being said, Qilin's whole iced tea menu is now on my list of things to do this summer.